Melbournian weather can have a terrible effect on the soul. After a long, cold winter, you might find yourself celebrating the arrival of spring, when suddenly everything is cold and damp once more, and staring at the third blanket laid across your sad little bed makes you want to cry. So what better way to give you a little skip in your step than to check out of your humble dwellings for a night and into a place where the sheets are crisp, the heat is set to an almost humid 23 degrees and the shower has not one, but two spouts for you to luxuriate beneath? Better still, why not choose a brand new place whose original Asian kitsch (Ovolo began in Hong Kong) results in the simple philosophy of ‘Shiny happy people all around’? 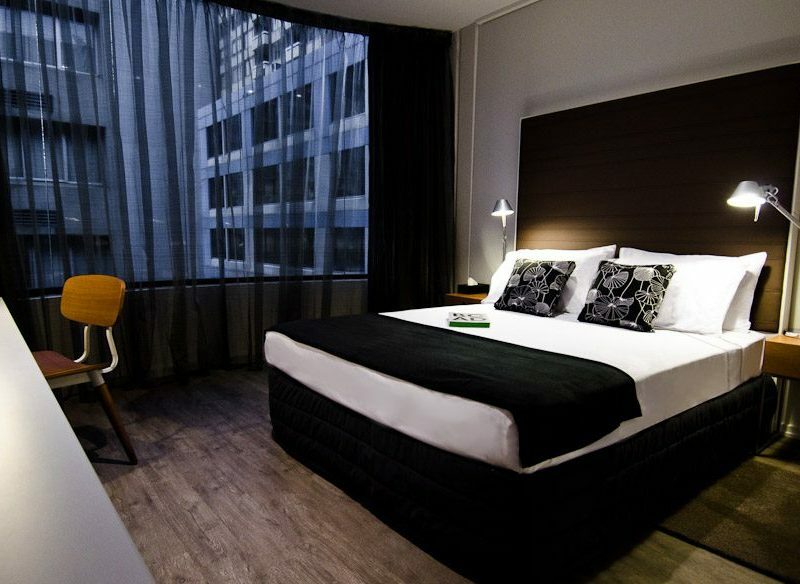 Ovolo’s move to Little Bourke Street is its first foray into the Australian market. It’s one of Hong Kong’s largest independent hotel and serviced apartment operators, and prides itself on its focused personal services, cutting edge in-suite technology and award-winning interior designs (which are perhaps a little too ‘block colour print’ for my tastes). Location-wise, they’ve made a smart move here – the hotel is near the theatre district and all the delicious restaurants of Chinatown, and a mere hop and skip from the business district for those doing a fly-in fly-out trip. In keeping with the rest of their hotels, their rooms are affordable, which is another boon. Well, either that or I’m about to have a depressingly cheap experience. But this little retreat in the heart of the city has a few surprises in store. Apart from the generous welcome my partner and I receive, along with an invitation to park our car directly out front (a blessing in the parking hell that is the CBD), we’re invited to help ourselves to the complimentary 24-hour ‘refreshment station’. The station lines the entrance foyer of the hotel, and includes a well-stocked fridge featuring bottled water and Charlie’s juice (although it would be nice to see support for a local Australian juice company), a tea and coffee station with a Nespresso machine and bowls of fresh fruit. I’m further surprised though when, after checking into our studio room (the most basic of the rooms on offer), we’re told we not only that the Wifi and Apple TV services are free, but that we help ourselves to anything in the minibar, and on top of that, there is a complimentary ‘loot pack’ to enjoy, with an assortment of snacks like crisps, peanuts, chocolate and mints. Given the tendency of most hotels to charge through the roof for even breathing the air, this feels like more than just a welcoming touch. In the grand scheme of things, it’s not revolutionary, but knowing that you don’t have to pay for the beer in your fridge really does make it seem more like home. Small city hotels tend to have the same general layout, and in this Ovolo doesn’t deviate. But they do score highly on the three most important things a short-term hotel room can deliver: a comfortable bed, a decent shower and the reassuring feeling that the tinted windows are actually tinted from the outside. On the shower front particularly (one of the most important parts of any hotel experience), Ovolo didn’t disappoint. I was actually battling a chronic flu during my stay, so pretty much all I wanted to do was crawl onto the tiled floor and fall asleep beneath the hot spray while trying not to drown. Happily, I’m pleased to say that I’m still here, and thanks to the shower’s therapeutic qualities (and better-than-average selection of toiletries – delicately fragrant and moisturising, they avoided that harsh stripping effect that seems compulsory in so many hotel amenities) I went to bed feeling marginally better. And the bed itself was indeed as comfortable as one could wish for. For me, a good hotel can be defined by its sheets. Any sign that they might be less than a centimetre thick is a sign that they are having a laugh at your expense. No, but really, sleeping here had a decidedly nice feel to it. Will Australians fall in love with this hotel? It’s modern and convenient, yes, but there’s a touch of something extra – a genuine desire to make the guests feel like they’re at home, without charging through the roof for the privilege. 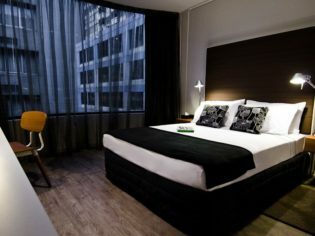 Not everyone can afford a luxury stay away, but for those travelleling to Melbourne looking for something that feels a little indulgent while remaining largely affordable, Ovolo isn’t a bad choice at all. And after grabbing some free water, juice and a tea on my way out the next morning, I sort of did feel like I got a bit more of my money’s worth. Next time, I think I might bring all my dirty washing and spend a pleasant evening using the free self-laundry and cruising the internet for ostentatious hats. Kind of like being at home I guess, but warmer and I won’t have to worry about anyone pounding on the door telling me to hurry up. It’s the little extra details that make this stay memorable. The ‘refreshment station’ and freebies really add to the overall experience. And the central location is a winner! Where: Ovolo Hotel, 19 Little Bourke St, Melbourne, Vic. Notes: Studio rooms start from $210 per night with the 81sqm penthouse with spa going for $595 per night. All rooms include free Wifi, free Apple TV and a free minibar. Self laundry is also available. Check the website for ongoing discounts and packages.